It’s no secret that technological advances are happening every day in nearly every aspect of our lives. From education to energy to our very own communication devices, technology is rapidly changing the world around us. While you might not immediately think of construction as being one of the industries embracing technology, the reality is, it is. We’re always actively seeking ways to enhance our day to day processes to make your buildings safer and our projects more efficient. Today, we’re taking a look at how technology in construction is improving and in many cases, changing the way projects are completed. Join us as we answer a few frequently asked questions about technology and its future in construction. What technology changes are happening in construction now? Allow us to geek-out for just a second: there are tons of “hot” technology changes in our industry, and it’s hard to narrow it down to just a few. However, if we had to select some of the things we’re seeing (and implementing), those would be Building Information Modeling, cloud-based systems, and top of the line collaboration software. Building Information Modeling, or BIM, is a process in which a digital model is used to find potential issues in a structure before we even get to the field. Not only does this allow us to heed off any potential problems, but it also helps us to coordinate tight spaces and adjust as needed. We’re also embracing cloud-based systems. Construction document storage allows drawings and other information to be accessed by anyone, anywhere. That means if you need an answer right away, a project is accessible at the tip of your fingertips on your smartphone or tablet. Literally. That concept brings us to yet another way we’re getting in on the technology game: real-time interaction between design and construction professionals through collaborative software. One of our favorites is BluBeam. How can improved technology help a project? Here’s a little trivia for you: did you know construction is the only industry that has become less productive over time? The Empire State Building, built almost 90 years ago and towering above New York City at 2.7 million square feet, was completed in 14 months at a cost of $40.8 million (approximately $535 million in 2017 dollars). By contrast, the most recently completed skyscraper in the United States, the Wilshire Grand Center in Los Angeles, took three times longer to build at twice the cost – even though clocks in at only half the size of the Empire State Building. There are a few factors that contribute to this, but the good news is that technology is truly changing efficiency in the industry by improving organization, enhancing communication, and encouraging productive planning. Remember those cloud-based systems we mentioned earlier? Those are a key part of this puzzle. How is Evergreen getting ahead of the curve when it comes to technology? We’re proud of our collaborative team filled with a variety of experiences and backgrounds. Our recent graduates and interns are keeping us in the loop and on our toes with the latest in industry technology. As a company, we’re also continuing our own education through seminars, webinars, conferences, and tradeshows in order to broaden our repertoire. One of the most exciting things we’re working on implementing is drone technology. 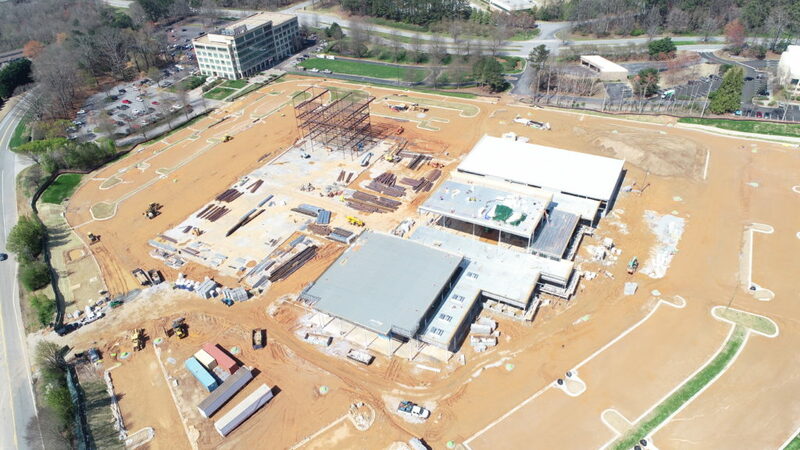 Not only do drones allow everyone on the team to see in real time where a project stands, but it also allows us to keep an eye on schedule management or drawing discrepancies. We believe this is a step towards improving the construction experience for our teams and clients alike. As construction technology heads into even more exciting directions, we can only imagine the possibilities. From improved planning and communication to reduced project costs, technology is going to change the face of construction. We’re grateful to not only be a part of it, but lead the change. Stayed tune to see more on what hot new trends we see. To find out more about what’s going on around Evergreen, click over to our blog.